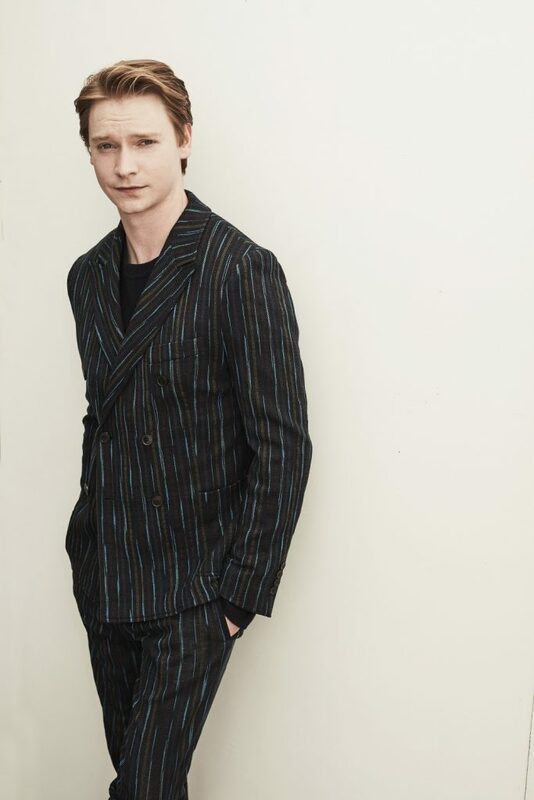 Awards Daily talks to Calum Worthy of Hulu’s The Act, on getting into a dark head space, eating what Nick Godejohn ate, and what he hopes audiences take away from this fascinating limited series. The heart of Hulu’s The Act is the dysfunctional mother-daughter dynamic of Dee Dee Blanchard (Patricia Arquette) and Gypsy Rose Blanchard (Joey King), which ultimately leads to tragedy. But another face behind the true crime is Gypsy’s boyfriend, Nick Godejohn, played by Calum Worthy. Under Worthy’s guise, Godejohn is not simply an accessory to murder, nor an accessory to this story, but serves as a character in his own right, in a truly captivating and heartbreaking performance. I had a chance to chat with Worthy about getting into this troubled character, including eating like Godejohn, and why he believes Godejohn is the hero of his own story for a moment. Awards Daily: Were you familiar with the story before you took the role? Calum Worthy: I was familiar, but only with the headlines. I remember seeing a CNN report about it, when it was first breaking news, but I didn’t know much past that. I remember friends telling me about the case, but I hadn’t done a deep dive yet. AD: I got familiar with the story through the HBO documentary Mommy Dead and Dearest. Did you watch that at all? CW: I actually watched that before I first went in for the role. I spent three days prepping this character just to read for it for the audition. I was really fascinated by Nick. AD: Once you got the role, what else did you do to prepare? CW: It was a pretty intense preparation process. I basically spent two months leading up to filming my first episode researching who this guy was. He is on the autism spectrum, and I wanted to make sure I portrayed that in an authentic way. I spent time at an autistic center for adults and worked with specialists to make sure I could hone in the performance, but make sure he wasn’t defined by that either. I read a bunch of literature about autism as well. I had his picture from before the crime took place as the background on my phone because I wanted to remember that he lived a lot of life before it all happened and he shouldn’t be just defined by being a criminal. I learned what part of his diet was and ate that leading up to the first episode. Once we started filming, I didn’t do that, but a week and a half before that, I wanted to know what he ate. AD: Wow. What was his diet? CW: He ate a lot of pizza and peanut butter, so I decided to really run with that and see what just eating those for couple of days would feel like. AD: So what did it feel like? CW: For the first time in my life, I thought, I wouldn’t mind a kale salad. AD: (Laughs) Wow. I can’t imagine eating that every day. CW: Another thing I did was watch the video of him being interrogated. It’s an hour long, and every morning before I’d go to set, I’d play that and make sure I was in the right head space and hone in on his voice and mannerisms. AD: Did the character stick with you after the director yelled cut? What did you do to unwind from that head space? CW: Once they said cut on the final episode, I was able to remove myself from playing the character, but since he’s a real person, sitting in jail right now, it was hard not to think about him a lot. Even though he committed a crime, I have a lot of empathy, but as an actor that’s your job. Every day I think about Nick and I hope he’s found some peace. AD: It’s his choice to get involved with this situation with Gypsy. But do you think she’s also pushing him to do it. Do you think he was a puppet or do you think he had a definite role in this? CW: I think they both played their roles. I have some theories in my own mind, but I also don’t want that to affect how people watch the show. I’m keeping my opinions a little bit of a secret right now just because I want to make sure people see it without that layer added on to it. But that’s one thing I hope people do get out of the show. I hope they watch it and have their own opinions as to who pushed whom more and who’s more responsible. That’s one of the most interesting things about this. We don’t define these characters as good or bad. We paint them as humans and all the complexities that come with the human experience. AD: Nick has his own story and troubles, separate from Gypsy. How did you try to bring that to the character? CW: Luckily we had Michelle Dean involved in the whole process, who was one of the showrunners along with Nick Antosca. She had shared a lot of research she had done on the case. She was able to fill in the blanks on a lot of the questions I had. The biggest thing for me is making sure that in the moment before the actual crime takes place, that we show how he is a complete human being, that by the end of the show, he’s not just defined by being a criminal, but by having a very complex life full of challenges. In those moments where he’s with Gypsy, when they first fall in love, I wanted to make sure that that seemed like a true love story. Even though it becomes quite tragic in the end, for that brief moment in time, they had each other and they were in love. He is in a very strange and twisted way the hero of his own story for a moment. AD: What was it like acting opposite Joey King? You guys have a great on-screen chemistry. CW: She’s amazing, and we became really good friends in the process. I truly look up to her as an actor. I was blown away at how authentic her performance was. We both felt a lot of pressure to get it right, and we wanted to make sure we were respectful. I was blown away at how dedicated she was to the character and to the process. She’s a true leader on set. When you have a lead role, you have the biggest part, but you’re also one of the leaders of the set, and she lives up to that role. AD: What do you hope audiences gain from this story/limited series? What do you hope they take away from it? CW: I hope once they watch the show they see these characters as complete human beings, and that they don’t have labels they’re defined by. They’re not the protagonist or antagonist, good or bad people, they’re complicated. They’re human beings. We can judge or define people by that, but the truth is we all have our challenges, and this is one of the challenges they face. But they are people and they live very complicated lives.